Rocky Horror Picture Show black and white mesh retro style promo cap or hat distributed exclusively at 2016 Comic-Con to promote the Fox remake of the cult classic movie. 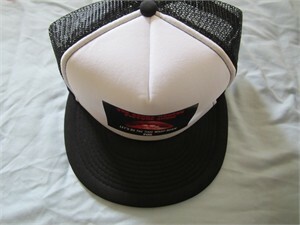 Adjustable size (snapback). BRAND NEW, NEVER WORN. ONLY 2 LEFT.